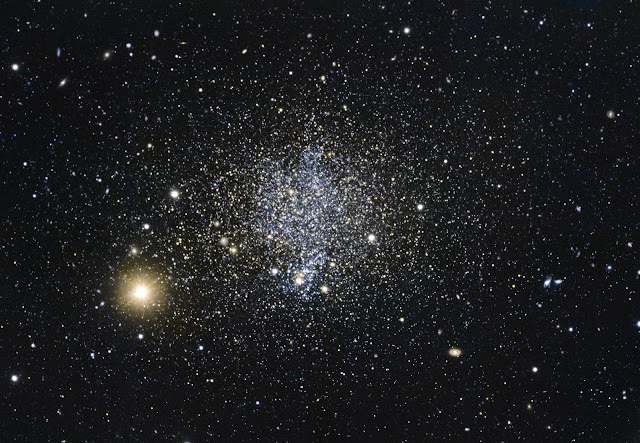 This European Southern Observatory image shows a dwarf galaxy in the southern constellation of Phoenix named, for obvious reasons, the Phoenix Dwarf. The Phoenix Dwarf is unique in that it cannot be classified according to the usual scheme for dwarf galaxies; while its shape would label it as a spheroidal dwarf galaxy—which do not contain enough gas to form new stars—studies have shown the galaxy to have an associated cloud of gas nearby, hinting at recent star formation, and a population of young stars. The gas cloud does not lie within the galaxy itself, but is still gravitationally bound to it—meaning that it will eventually fall back into the galaxy over time. Since the cloud is close by, it’s likely that the process that flung it outwards it is still ongoing. After studying the shape of the gas cloud, astronomers suspect the most likely cause of the ejection to be supernova explosions within the galaxy. The data to create this image was selected from the ESO archive as part of the Hidden Treasure competition.